With a low cost of living, a robust workforce, and simple regulations, Oklahoma has become a great state in which to open a small business. In 2017, the Oklahoma business sector had over 330,000 active small businesses, hiring nearly 700,000 employees. 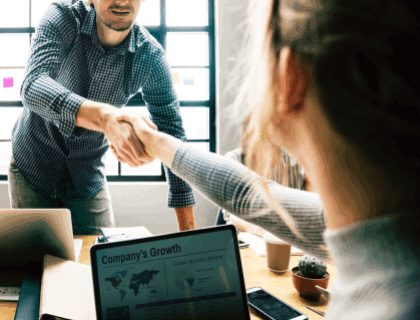 There are also special versions of some legal structures available including limited partnerships, general partnerships, C corporations, and S corporations. Each business structure has several advantages and disadvantages. When choosing your business structure, analyze the different tax and financial benefits, and liability protection. Consider contacting an attorney, accountant, financial advisor, or banker to determine which legal structure is most suitable for your business. 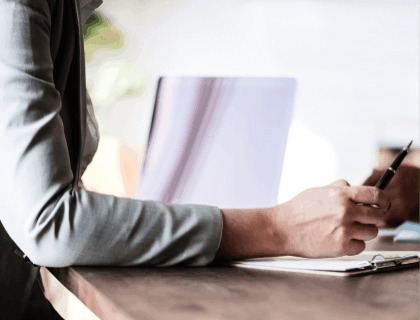 An LLC is a common choice for small business owners because of its minimal paperwork, flexibility, tax benefits, and simple implementation process. LLC business owners are not obligated to file a corporate tax return. You can set up an LLC in the state of Oklahoma for $100.00. Your business plan is the foundation of your business, listing your concept, purpose, and goals, as well as the steps needed to reach them. In addition, it serves as your business's resume, detailing your objectives to potential investors, partners, employees, and vendors. To secure your business name, you will need to register it with the Oklahoma Secretary of State. However, before you are able to register your name, you will need to check that your business name is different from other business names already on file with the Oklahoma SOS. For LLCs and corporations, you can check for available business names by performing a business entity search. Available names can be reserved for 60 days by filing a Name Reservation Form with the SOS. There is a $10.00 filing fee. 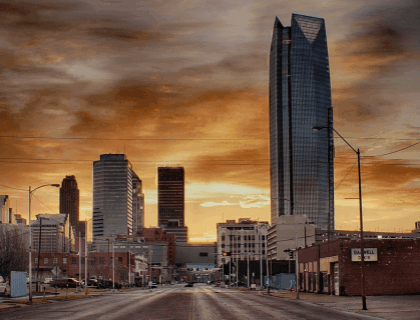 In Oklahoma, a sole proprietorship or partnership must file a Trade Name Report with the SOS if their business name doesn't include the owner/s name or surname. There is a $25.00 filing fee. Furthermore, to avoid trademark infringement, you should do a federal and state trademark search with the U.S. Patent and Trademark Office (USPTO). If your business is taxed separately from you or requires employees, you will need to obtain a federal Employer Identification Number (EIN). You can complete an online application on the IRS website. There is no filing fee. Opening a business bank account will help ensure your personal and business finances remain separate. Find out about the different types of accounts and fees on offer at your local banks. 6. Register with the Oklahoma Tax Commission. In Oklahoma, sales tax permits are required for retailers, resellers, or others that sell tangible goods on a continuous basis. You can obtain a sales tax permit from the Oklahoma Tax Commission. Furthermore, if your business has employees, you will need to apply for employer withholding tax. You can register for both taxes online by using the Oklahoma Online Business Registration System. There is no filing fee. Under Oklahoma law, all employers must report certain information on their newly-hired or re-hired employees to the Oklahoma Employment Security Commission (OESC). The reporting process needs to be done within 20 days of employment. For quick and efficient reporting, you can use the online portal. You will need to create an account to access the online services. You can also report employees by fax or by mail. Simply download the form and follow the mailing information at the top of the form. In Oklahoma, there is no generic license required to own or do business. However, many businesses, business owners and/or their employees, may require special licenses and permits to legally operate in the state. Depending on your business, some permits are may be issued by a city or local government. To find out about the different licenses and permits issued by the state, visit the Business Licensing & Operating Requirements section of the Oklahoma Department of Commerce website. Businesses that employ professionals may also require additional licenses and permits. These cover various industries and businesses. Search the Professional License Online Services section on the state government website for more details. Oklahoma business owners with one or more employees are obligated to carry workers' compensation insurance. For more comprehensive information about exemptions, visit the State of Oklahoma Workers' Compensation Court. In addition, it's mandatory to have minimum automobile insurance for your business drivers. If your business uses your personal truck or car, a commercial vehicle policy is recommended. As a business owner, it's important that you remain informed about any regulatory updates or changes that may affect your business or industry. Depending on your business, you may also be responsible for regularly filing documents with the Oklahoma State. If you operate an LLC or corporation, you will need to file an annual certificate with the Oklahoma Secretary of State. For an LLC, you can either complete the certificate online, or you can download the form and mail it in. There is a $25.00 filing fee. Finally, in Oklahoma, corporations are also subject to corporate income tax and corporation franchise tax. Income tax returns are due on the 15th day of the fourth month after the end of the tax year. How much does it cost to register a business name in Oklahoma? It costs $10.00 - $25.00 to register a business with the Oklahoma Secretary of State. Where can I apply for an Oklahoma sales tax license? You can register online by using the Oklahoma Online Business Registration System. Are there any specific rules for an LLC in Oklahoma? In order to register your LLC, you must file the articles of organization with the State of Oklahoma. You can file online, by mail, or in person. The filing costs $100.00. How many small business owners are there in Oklahoma? There are 336,908 small businesses in Oklahoma, making up 97.1% of businesses in the state. 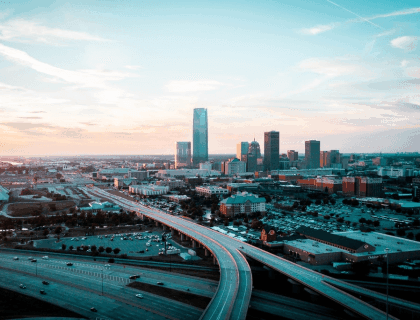 Does my Oklahoma business require an operating agreement? An operating agreement is not required in Oklahoma. Yes, in Oklahoma, you are required to carry workers' compensation. 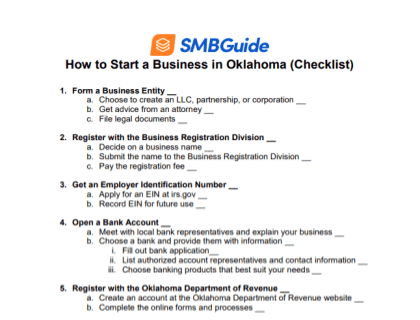 How do I register a business name in Oklahoma? You can register your business name with the Oklahoma Secretary of State. You can visit the SOS website for the proper documentation.